Sodium caseinate is the biochemical name for casein, which is a type of protein found in the milk from all mammals. Casein, which is Latin for "cheese," is a major component of commercial cheese and its principle source of protein. Casein is also used as a food additive and for industrial purposes. Some people are allergic to sodium caseinate, and it has been linked to some human diseases, mainly autism and gastrointestinal problems. Consult with an allergy specialist if you suspect an allergy or intolerance to any casein-based product. Casein is the name for a group of four related proteins. These proteins are found in all mammalian milk, providing 80 percent of the protein in cow milk and about 60 percent of the protein in human milk, according to the textbook "Nutritional Sciences." Overall, casein represents about 3 percent of the content of cow milk, but more than 10 percent for most cheeses. As a food source, casein supplies essential amino acids, carbohydrates, sodium, calcium and phosphorus. Cheese consists of proteins and fat from the milk of certain animals, usually cows and goats. 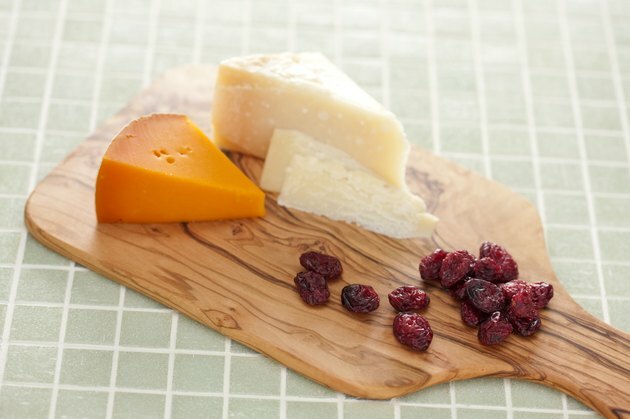 Cheese is produced essentially by the coagulation of casein, which is helped by the addition of acids and proteolytic enzymes, according to the textbook "Biochemistry of Human Nutrition." Unlike many proteins, casein is not coagulated by heat. Casein should be distinguished from whey, which is another protein found in cow milk and cheese but in much smaller percentages. In addition to cheese production, casein isolates were used in paper products, paint and plastics before being mostly replaced by petroleum-based polymers. As such, caseins are now used primarily in food production, where they add nutrition, flavor and specific consistencies. According to the textbook "Contemporary Nutrition," casein derivatives are widely used in certain meat products, coffee whitener, processed cereals, baked goods and processed cheeses. Most allergic reactions to cow milk and cheese products, aside from lactose intolerance, are due to the presence of casein, according to the textbook "Human Biochemistry and Disease." Whey protein produces far fewer allergic reactions in comparison. Further, casein breaks down to produce the peptide casomorphin, which acts primarily as a histamine releaser and contributes to allergic reactions, but some research indicates it might aggravate the symptoms of autism, according to "Human Biochemistry and Disease." More research is needed before any warnings are considered.